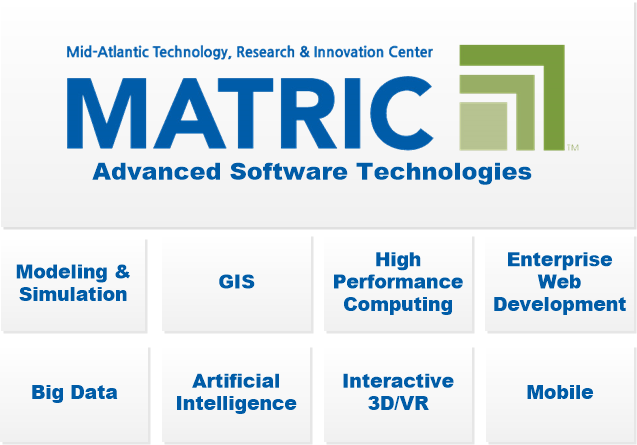 MATRIC’s Advanced Software Technologies group provides customers with unique offerings to specifically meet their needs. Our employees have the expertise to provide our clients with the speed necessary to compete in today’s market. Our capabilities are large enough to deliver diverse market offerings, but we remain small enough to know that our success is defined through partnering with our customers and truly knowing and exceeding their needs. We additionally anticipate market needs and develop, design and deploy our own proprietary packages that bring value to a broader customer base. In either circumstance, we remain focused on our customer and deliver market driven innovation. Modeling & Simulation development that combines geographic information systems with gaming technologies to fuse real world data with next generation interactive immersive environments to provide unique operational tools, experiential training environments, and ‘what if’ scenario planning. Geographic Information Systems (GIS) for the collection, integration, analysis, and dissemination of location based information—turning data into actionable knowledge. High Performance Computing with a strong understanding of the relationships between server hardware, operating systems, virtualization, and load balancing to optimize runtime performance of demanding computational tasks. Enterprise Web Development to make innovation “web accessible.” Our team has developed enterprise web applications for domains including simulation, geospatial visualization and data analytics. Big Data application development expertise for the creation of recommendation engines based on full text document analysis, web cataloging, geospatial data mining, graph theory, and image analysis. Artificial Intelligence application development ranging from emulating humanistic conversational AI medical simulations to the use of intelligent agents for modeling entity behaviors during mass evacuation simulations. Interactive 3D/VR technology utilizing custom OpenGL and Unity3D based applications for scientific visualization to provide insights into complex data sets. Mobile development expertise of responsive web applications that auto-scale from desktop to mobile devices enabling users to interact with enterprise data from virtually any web enabled device.